Note: This feature is for all Business level plans. 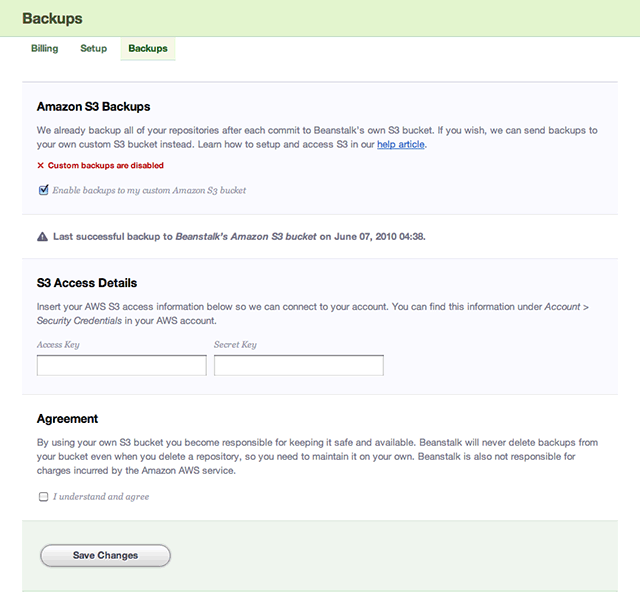 If you are on the business plan or higher, it is possible to send repository backups to your own Amazon S3 account. This provides an extra level of comfort that backups are safe, private and in your hands when you use Beanstalk. To send repository backups to your own S3 account, you must first sign up for Amazon AWS or login to your AWS account to retrieve your credentials. The credentials (Access Key ID and Secret Access Key) can be found in your AWS account under Account > Security Credentials. Once you have obtained your AWS credentials, login to Beanstalk as the account owner, then go to Account > Backups. Once there, you can enable custom S3 backups by inserting your credentials and clicking save. When the settings are saved, Beanstalk will sync your repository directories with a bucket on S3 called "beanstalk-backups-accountname". This is an exact replica of your repositories on Beanstalk, which can be used to move or restore on any server. When deleting a repo from your Beanstalk account, the backup on S3 will remain. Should a backup to S3 fail for any reason, Beanstalk will generate an incident and notify the account owner via email.